Definition at line 167 of file Notes.h. Definition at line 193 of file Notes.h. Definition at line 170 of file Notes.h. Definition at line 195 of file Notes.h. References Note::key(), Note::Value::operator=(), Note::toString(), Note::Value::value(), and Note::values. Adds a note key and value to the notes list. If the key name already exists in the list, add the given value to its set of values. Definition at line 280 of file Notes.cc. Referenced by Helper::Reply::finalize(), Adaptation::Icap::ModXact::makeRequestHeaders(), Helper::Reply::parseResponseKeys(), redirectHandleReply(), redirectStart(), Adaptation::Ecap::XactionRep::start(), storeIdStart(), Ssl::Helper::Submit(), Note::updateNotePairs(), and UpdateRequestNotes(). Definition at line 274 of file Notes.cc. Adds a note key and values strList to the notes list. If the key name already exists in the list, add the new values to its set of values. Definition at line 327 of file Notes.cc. Definition at line 342 of file Notes.cc. Referenced by Http::One::Server::buildHttpRequest(), externalAclHandleReply(), redirectHandleReply(), and ExternalACLEntry::update(). Append any new entries of the src NotePairs list to our list. Entries which already exist in the destination set are ignored. Definition at line 349 of file Notes.cc. Referenced by Auth::User::absorb(), and ClientHttpRequest::initRequest(). Definition at line 244 of file Notes.h. Definition at line 242 of file Notes.h. Referenced by Format::Format::assemble(), HttpRequest::hasNotes(), operator<<(), and Note::updateNotePairs(). If delimiters are provided, returns another Entries, converting each single multi-token pair to multiple single-token pairs; returns existing entries otherwise. Definition at line 314 of file Notes.cc. 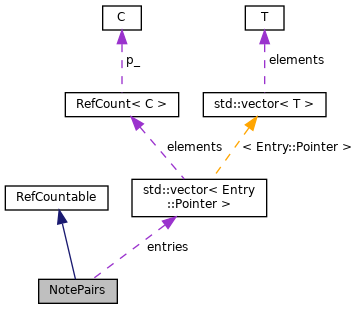 const char * sep = ","
resultNote a comma separated list of notes with key 'noteKey'. true if there are entries with the given 'noteKey'. Use findFirst() instead when a unique kv-pair is needed. Definition at line 240 of file Notes.cc. References SBuf::append(), SBuf::clear(), SBuf::isEmpty(), and SBuf::length(). Referenced by Format::Format::assemble(), and Auth::UserRequest::denyMessageFromHelper(). the first note value for this key or an empty string. Definition at line 265 of file Notes.cc. Referenced by ClientRequestContext::clientRedirectDone(), ClientRequestContext::clientStoreIdDone(), externalAclHandleReply(), and UpdateRequestNotes(). Definition at line 333 of file Notes.cc. Referenced by Adaptation::Icap::ModXact::makeRequestHeaders(), and Adaptation::Ecap::XactionRep::start(). Remove all notes with a given key. If keyLen is not provided, the key is assumed null-terminated. Definition at line 286 of file Notes.cc. Referenced by Note::updateNotePairs(), and UpdateRequestNotes(). Definition at line 294 of file Notes.cc. Replace existing list entries with the src NotePairs entries. Entries which do not exist in the destination set are added. Definition at line 358 of file Notes.cc. Convert NotePairs list to a string consist of "Key: Value" entries separated by sep string. Definition at line 254 of file Notes.cc. References SBuf::appendf(), SBuf::c_str(), SBuf::clear(), and SBuf::isEmpty(). Referenced by Format::Format::assemble(), and operator<<(). Definition at line 251 of file Notes.h. Referenced by append(), appendNewOnly(), and replaceOrAdd().